swollen, scarred trunk near a Cordia patch. For scientists, the clearings in the forest understory around patches of Cordia are caused by a mutualistic relationship with the ants. Cordia plants provide the ant colony with hollow branch nodes for nesting and bristly corridors along twigs and leaves for protection, while the ants use their strong mandibles and acidic secretions to clear away competing vegetation. Local Quechua-speaking colonists refer to the clearings as “Devil’s gardens” (supay chacra). For the Matsigenka, these clearings are the work of spirits known as Sangariite, which means ‘Pure’ or ‘Invisible Ones’. 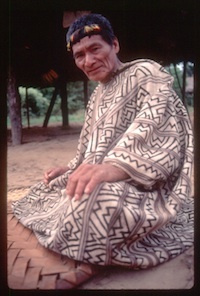 Matsigenka shamans like Mariano come to these spirit clearings and consume powerful narcotics and hallucinogens such as tobacco paste, ayahuasca (Banisteriopsis), or the Datura-like toé (Brugmansia). in the upland forests of Manu Park. With the aid of visionary plants, the shaman perceives the true nature of these mundane forest clearings: they are the villages of Sangariite spirits, unimaginably distant and inaccessible under ordinary states of consciousness. While in trance, the shaman enters the village and develops an ongoing relationship with a spirit twin or ally among the Sangariite, who can provide him or her with esoteric knowledge, news from distant places, healing power, artistic inspiration, auspicious hunting and even novel varieties of food crops or medicinal plants. 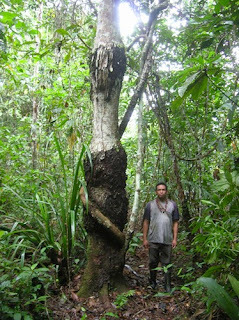 As proof of the existence of these invisible villages, Mariano pointed out to me the scars on adjacent tree trunks all around large, dense Cordia patches: “The scars are caused by fires the Sangariite set to clear their gardens every summer,” he explained. Sangariite spirits during an ayahuasca trance. 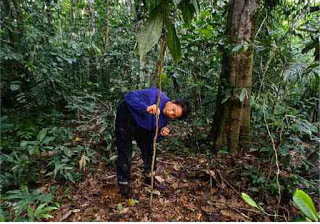 Douglas Yu, an expert on ant-plant interactions, was researching Cordia populations in the forests around Yomybato. 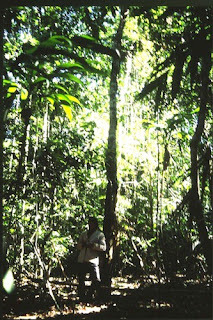 I told him of Mariano’s observations about the Sangariite villages, and pointed out the distinctive marks on adjacent trees. In his years of research, Yu had never noticed the trunk scars. Intrigued, he cut into the scars and found nests teeming with Myrmelachista ants that appeared to be galling the trunks to create additional housing. 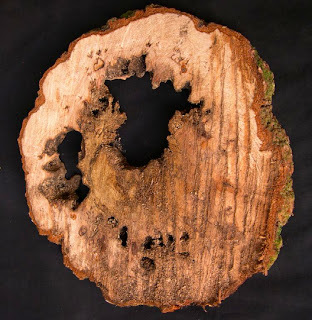 As detailed in a 2009 publication in American Naturalist, this case is the first recorded example of ants galling plants, reopening a century-old debate in tropical ecology begun by legendary scientists Richard Spruce and Alfred Wallace. The discovery of Myrmelachista‘s galling capability also helped Yu understand how this ant species persists in the face of competition by two more aggressive ant types, Azteca and Allomerus, that can also inhabit Cordia depending on ecological conditions. interactions in the Peruvian Amazon. My ongoing collaborations with Yu and other tropical biologists in indigenous communities have highlighted how important it is to pay attention to local people’s rich and often underappreciated knowledge about forest ecosystems: sometimes even those elements of folklore that appear quaint or “unscientific” contain astute insights about natural processes. — This article was first published online on Nov. 7, 2011 with Spanish and Portuguese translations by O Eco Amazônia. G.H. Shepard Jr. (1998) Psychoactive plants and ethnopsychiatric medicines of the Matsigenka. Journal of Psychoactive Drugs 30 (4):321-332; G.H. Shepard Jr. (2005) Psychoactive botanicals in ritual, religion and shamanism. Chapter 18 in: E. Elisabetsky & N. Etkin (Eds. ), Ethnopharmacology. Encyclopedia of Life Support Systems (EOLSS), Theme 6.79. Oxford, UK: UNESCO/Eolss Publishers [http://www.eolss.net]. G.H. Shepard Jr. (1999) Shamanism and diversity: A Matsigenka perspective. In Cultural and Spiritual Values of Biodiversity, edited by D. A. Posey. London: United Nations Environmental Programme and Intermediate Technology Publications. D.W. Yu, H. B. Wilson and N. E. Pierce (2001) An empirical model of species coexistence in a spatially structured environment. Ecology 82 (6):1761-1771.